Lemurs are grey with white faces. They have black circles around their eyes. They have very long tails with black stripes. They are considered to be related to monkeys. 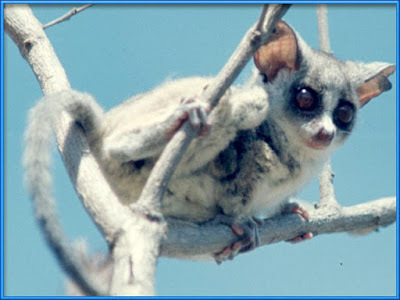 They range in size from the one ounce lemur which is called the Pigmy Mouse Lemur to large twenty-two pound lemurs. Lemurs are found on the island of Madagascar and the islands which surround it. Lemurs eat a variety of fruits, flowers, leaves and herbs. They also eat some insects and small vertebrates. Lemurs are omnivorous animals. Lemurs live in colonies in wooded areas. Lemurs communicate via scent from the glands on the feet and buttocks, via loud screeching noise and by using their long tails. Lemur is adapted to the life in the trees, but some species, such as ring-tailed lemur, spend plenty of time on the ground. The small types of Lemurs like to be active at night and sleep during the day. The large types of Lemurs are just the opposite, liking to be active during the day and sleep at night. Lemur is very intelligent animal. It can learn to use tool and perform simple arithmetic tasks. Lemur can survive around 18 years in the wild and up to 30 years in the captivity. Many kinds of lemurs are now extinct and scientists are working hard to keep this from happening to other kinds. Lemur has human-like hands with opposable thumbs and flat fingernails. Second toe on the hind feet is equipped with claw that is used for grooming.